Wet Shaving can be an exciting hobby it can also get out of hand if you let it. At first you just want to try and use everything which can be fun but before you know it your spending hundreds and in some cases even thousands of dollars. Let's try to remember one of the reasons why you got into this hobby in the first place to save money right? So if your new to wet shaving take my advice and head over to the Italian Barber website. Do a search on shaving soaps and creams under the Italian Barber brand and take a good look around. Great performing products lots to choose from and best of all reasonably priced. Which brings me to my next review of the Italian Barber’s Milionario. 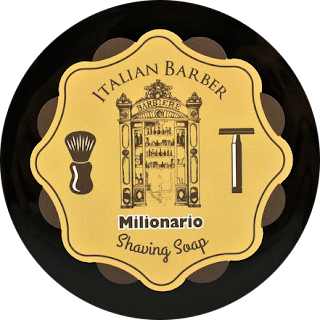 The packaging for Milionario comes in a black stackable tub with screw on lid. Top label clearly states the company and product name but it’s lacking side labels. For a tub that has been praised in the past for it’s stack ability one would think that the absences of side labels would have been addressed by now. When I opened the tub I was floored by the scent I just couldn’t but it down. The combination of the notes is perfect to me. Let me list them here as described on the website: A strong high-impact, complex fragrance, very masculine. Features notes of grapefruit, rose, cinnamon, spice notes, mint, blood orange, blond leather, white woods, amber and patchouli. To me it’s like shaving with an expensive cologne, fantastic. The scent lingered in the den for over an hour after the shave. 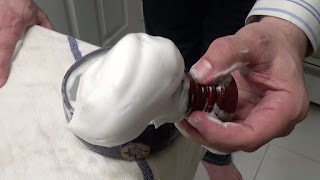 Lathering was no problem, I could have loaded my brush from the tub but I like using my shaving bowl and once I had the correct amount of water I was able to create an abundant amount of rich creamy lather which gave me great coverage that held on to my 4-day beard. The slickness and glide was present for the entire shave along with the scent. As I was explaining before you don’t have to spend a lot to get a lot. The truth is Millionario costs $4.99 for 4.2oz and that’s not the cheapest shaving soap IB sells the last time I looked AMICI which is another great shaving soap is only $2.99 in fact if you took all the IB soaps and added them up you would spend $47.90 and in that collection you would have ten (10) shaving soaps to try. So if your new to wet shaving and on a budget you could say you hit the jackpot with Italian Barber.